I sit here at my computer with my garden gear on complete with floppy, wide-brimmed white garden hat and I’m smiling because it’s June in my garden. That means that my plants have flowers and soon will begin to set fruit. Things are really growing nicely. 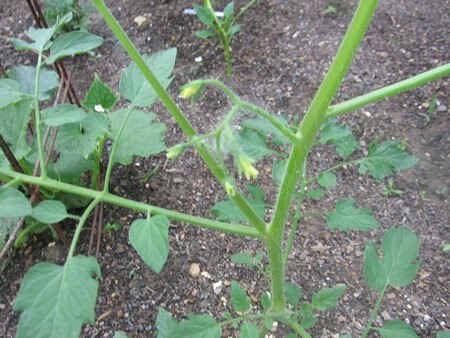 I have little yellow buds on quite a few of my mater plants. They are a very welcome addition to my garden scene because I know those delicious maters are not far behind! as they wave their green arms and say hello to their cucumber neighbors behind them. Shallots are a very sweet, mild onion that really add a wonderful flavor to any recipe. 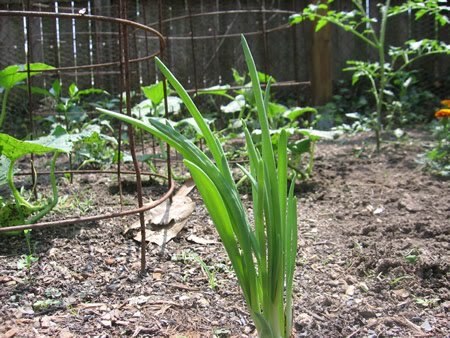 I sometimes replace regular onions with shallots because of their mild sweetness. 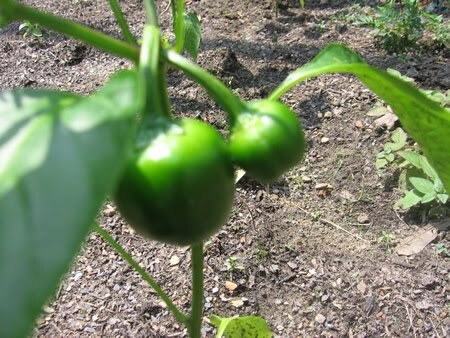 I added two pepper plants to my garden this past weekend. The cultivar is ‘bhut jolokia’ otherwise known as ‘the ghost pepper’. This pepper measures over one million on the Scoville scale. You literally could take just a pencil tip amount of one of these and make any recipe extremely hot and spicy. 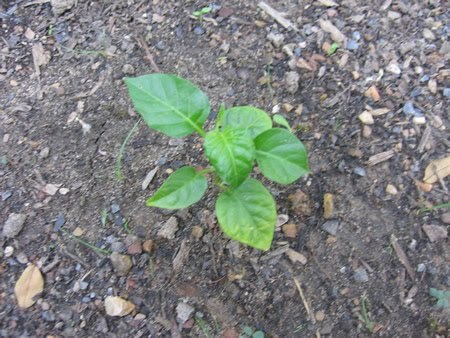 Speaking of peppers, my habanero seedlings (the third picture) are doing very well. I grew these from seed in March. All eight of them survived! They are only about two inches tall, but very healthy. I wonder why they are growing so slowly? Maybe that slow growth is what makes them so spicy! My bell peppers are ringing in the month of June quite nicely. I love the smell of a freshly cut pepper. It takes me immediately to the smells and sounds of Thanksgiving day and time spent with my family making foods that nourish the body and comfort the soul. I just love all the green in my garden and the splashes of orange and yellow against the brown soil. I really could just stay in my garden all day and find something new that I didn’t see before. 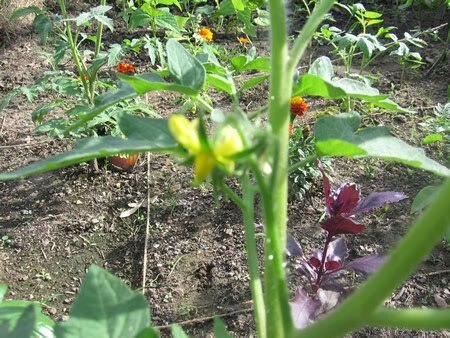 Below is another tomato plant with flowers on it. My camera wanted to focus on the purple basil and other plants in the background. One of these days I need to get a better quality camera. But alas, I work with what I have. Movin’ on down the line in pictures we have my okra plants. I started these from seed as well. 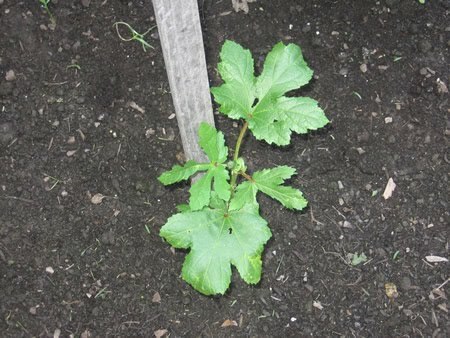 Okra seems to be another slow grower, but will be well worth the wait. A lot of people don’t like okra, and I count myself among that crowd unless it is sliced up in some gumbo! Here is my first casualty of Fat Earth. This is one of my Georgia collards that I grew from seed. I was wondering why my slug intervention was not working. It turns out it wasn’t slugs eating away at my greens, it was a cabbage worm…and he took the time to poop all over one of my leaves. I pulled this plant out and threw it in the garbage. I don’t think my other collards will make it. They are all just eaten to death. That makes me sad. If I was a bug eater, that worm would have SO been sauteed with some onions and a little salt and pepper. 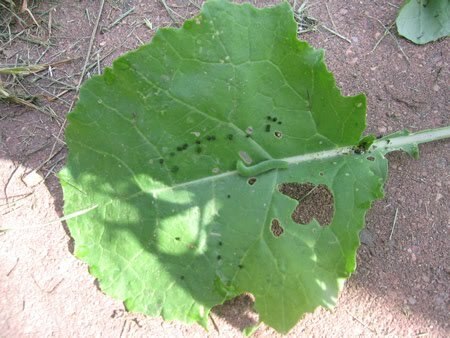 If the collards are the only plants that succumb to a disease or insect attack, I will count myself blessed. Well garden gals and guys, this is Audra Russell……………good day!